gab collaborated with Hackney Downs Studios (HDS) on projects such as ‘The Wall’ and became aware of the vast amount of hard waste that was accumulating as they renovated their warehouse/studios. Inspired by all this material seeing it not as waste but as a medium, the tree project came into fruition. Taking into context HDS’ location which is next to Hackney Downs park and The Russet cafe being named after an apple tree we took the idea to create a recycled sculptural tree. This fit the HDS development of the The Village Green; a brand new independent shopping and cultural development. 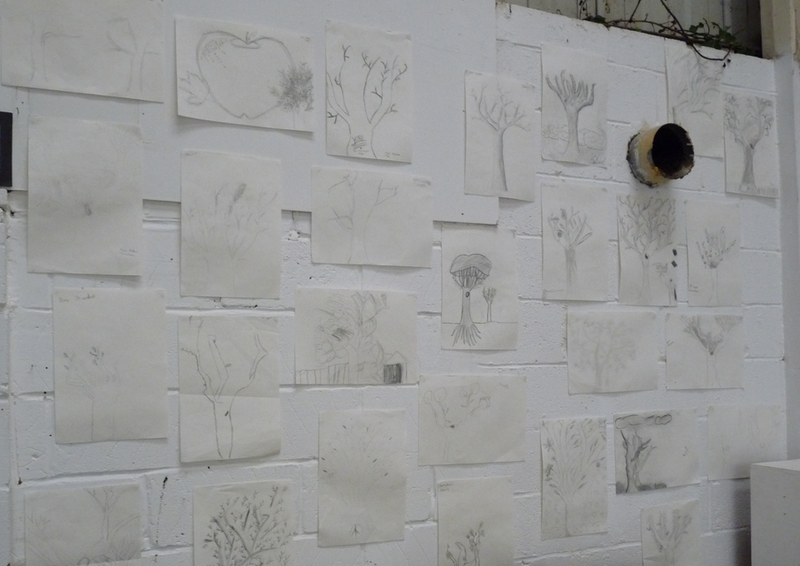 Last academic year we facilitated some workshops with the students from Petchey Academy, creating observational drawings from trees in the local area to inform the design and shape of the sculptural tree. A collection of the children’s drawings – on display as part of an exhibition at The Russet Cafe. gab worked alongside Phil Neal to bring the ideas of the local school children to life.